ART for the Masses, ART for the People. : Ali The Greatest 4, May 2017, HS, For JEHOVAH 38. by The Meek, Glasgow Cowboy. : Current and Past Work Jan 2008 onwards. Ali The Greatest 4, May 2017, HS, For JEHOVAH 38. A Water Colour and Pastile Painting with calligraphy of Muhammad Ali The Greatest.this is my 4th Ali ART Work, I believe this is my best A3 ART Work so far. It did not take me long to plan it and complete it. 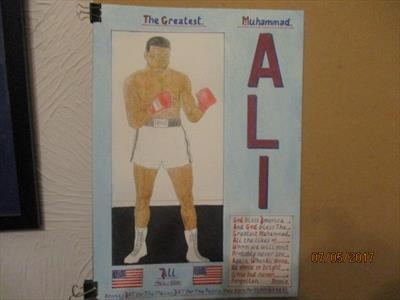 I was told that this ART work and ALI 3 ART work are the most reproduced, posters and prints made of, pieces of ART in the history of Art and I am not being allowed access to any of the money earned from it, there is no justice, you can just imagine the amount of Sales Tax paid on this Art Work it could well add up to millions of dollars/pounds. ART For The Masses ART For The People.